At Georgia Tech, our athletics brand is our Everyday Champions — the young people who compete at the highest level of intercollegiate athletics, excel in one of the most rigorous and rewarding academic institutions in the world, and pursue Dr. Homer Rice’s model of excellence and personal well-being in all aspects of life. I believe that our success is defined through all three facets of our Everyday Champions formula: Winning + The Institute + The Total Person Program. As we strive to recruit the nation’s most elite student-athletes, we want those young people to realize that when they evaluate Georgia Tech against our competition, it is an apples versus oranges comparison. 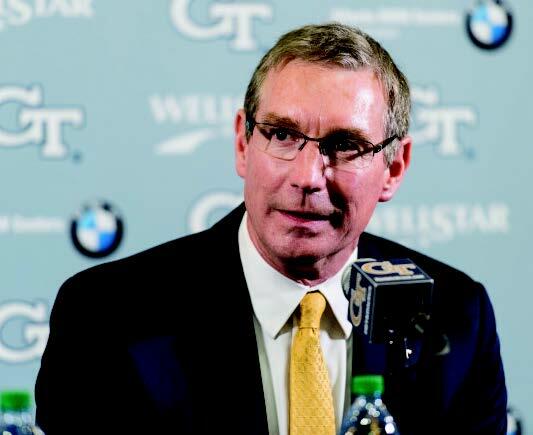 At Georgia Tech, they will have an opportunity unlike any other at the Power 5 level to develop into elite student-athletes and win championships, acquire the skills that will position them for a lifetime of success, and take advantage of the tremendous opportunities in Atlanta. However, the unparalleled opportunities that Georgia Tech provides our student-athletes would not be possible without the generous philanthropic support of our alumni and friends. Your support is more important now than ever. We are in a tough neighborhood, as a member of one of the nation’s most competitive conferences (the ACC) and firmly in the footprint of another (the SEC). As most know, three of the four semifinalists in the 2018 College Football Playoff are located within three hours from our campus, but that is just the tip of the iceberg — the competition abounds across all sports. The Georgia Tech Athletic Association has set a fundraising goal of $125 million for its Athletics Initiative 2020. These critical funds will not only continue to develop Everyday Champions, they will launch the Yellow Jackets toward new heights of excellence and innovation while helping us strengthen key areas and target strategic priorities in a fashion true to our Georgia Tech DNA — with determined spirit, minus excess and frills. We invite you to help us achieve our ambitious goals; in fact, we cannot achieve them without you. Your gifts and engagement with Georgia Tech athletics are the investments we need to ensure a world-class experience for every recruit, student-athlete, coach, and fan who comes to The Flats. Thank you, and Go Jackets!